Who is promoting this campaign? 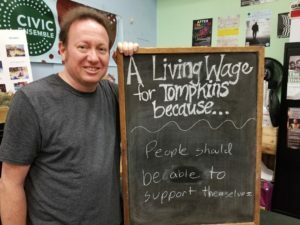 The Tompkins County Workers’ Center (TCWC) is leading a coalition of workers, businesses, local governments, and community organizations that support making the minimum wage a living wage. The TCWC is a nonprofit community organization with over 1,300 members that seeks to support, advocate for and empower all people treated unfairly at work. For almost 20 years we have promoted a living wage standard for our community, and for all workers. A living wage is the minimum wage a single adult working full-time requires to meet his or her basic living expenses, including rent, food, transportation, health care, other necessities, taxes, and a modest allowance for recreation and savings. For a single person in Tompkins County the living wage currently is $15.11/hour. The living wage for a family with children is much higher. The Tompkins County Living Wage has been calculated every two years since 1994 by Alternatives Federal Credit Union. The AFCU living wage figure is widely used and accepted in the community. The NYS minimum wage, currently $10.40/hour, is not calculated in relation to any cost of living so is not a living wage and, in fact, is so low that it results in poverty and dependence on public assistance. 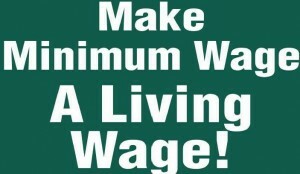 Why should the minimum wage be a living wage? Jason Leifer, Dryden Town Supervisor. The Town of Dryden has endorsed our Countywide minimum wage as Living Wage campaign. Tompkins County is really two counties. While a portion of the population thrives, many more face put in a full day’s work every day, but at the end of the week find they do not have enough to support themselves and/or their families. This is unfair to these workers, unjust in a society filled with wealth, and immoral in a community that values and supports families. Martin Luther King Jr. put it well: “Equality means dignity. And dignity demands a job and a paycheck that lasts through the week.” This is why the minimum wage must be a living wage. And this is not merely an issue of fairness, moral justice and sustainability for these working families, but also something to benefit the entire community. Isn’t the minimum wage already increasing in New York? Last year NYS authorized an increase in the minimum wage in stages till it reaches $12.50 in 2021 in upstate counties. It is currently $10.40. While this increase in the minimum wage is welcome it is far from a Living Wage – currently it is only two-thirds of a Living Wage. That other ‘third’ is the difference between a basic but secure living standard and a living standard defined by impoverishment, insecurity, periodic family crisis and dependence on public assistance. How can we make the minimum wage a living wage? Numerous cities and counties around the country have established their own minimum wage statutes, providing a higher minimum wage for workers than their state or federal law allows. Most citizens believe this is the right thing to do as vote after vote and poll after poll shows – such policies are backed by large majorities of citizens and voters. Tompkins County, responding to local conditions and local desires, can and should move to do the same – we should enact a local law making the minimum wage a living wage for workers whose jobs are within the county’s borders. This local law would then have to be submitted as a “home rule” request to the state for approval by state legislators in Albany before it could take effect. New York makes it a two-step process in contrast to the one-step process in many other states. How would this help workers? A full-time minimum wage worker in Tompkins County earns $21,632 (working 40hours/week, 52 weeks in the year). This is significantly below the Tompkins County Living Wage of $31,429 (@ $15.11/hour). We estimate that approximately 30% of Tompkins County workers currently earn less than a living wage. Based on national figures their average age is 35, most work full-time, and almost one-third are supporting children. This pay gap between the current minimum wage and a living wage has major negative consequences for these workers and their families. Earning less than needed to cover basic household requirements means being deprived of basic amenities. This gap results in substantial economic and social hardship, and forces people into dependence on publicly-funded services, like housing assistance, food stamps and medicaid. In addition, the resulting “paycheck to paycheck” existence is precarious. These families are one missed paycheck or one unexpected bill or expense from family crisis. This can result in times of hunger, of homelessness, of eviction for not being able to afford the rent, of losing good jobs for not being able to afford the necessary car repair, of winters without adequate heat, of children missing their parents because they are forced to work two jobs and even then often not able to make ends meet. How does the community benefit from a living wage? If employers do not pay their employees enough to live in our community, who makes up the difference? Taxpayers do. The working poor end up needing government to step in with food stamps and other social programs that are funded by tax dollars, and also represent a huge subsidy paid to low-wage employers. Making the minimum wage a living wage will result in lower property taxes as fewer residents will need public assistance. Gains in school performance and graduation rates – child development research that follows low-income children into their adult years has found significant and lasting benefits when incomes rise for the children’s families. Aren’t most of the people in these low wage positions teenagers just earning some extra spending money or in unskilled “starter jobs”? The vast majority of low-wage workers are adults; only 6% of those earning less than $15/hour are teens. And many of these teenagers are no longer in school or living with parents. Or if they are living with a parent, their earnings may be critical to their family’s survival. The minimum wage was never established to be a “starter wage.” It is really more like a “survivor wage” established by society to constrain the negative effects of an unregulated labor market. Does raising the minimum wage lead to inflation? Any inflation generated by an increase of wages is likely to be small because even if some prices rise not all will; some may even go down. Some businesses may not raise prices much or at all because the wage increase will be absorbed by increased spending or efficiencies, or will occur over a number of years and will more easily be absorbed. And those that do choose to raise prices are not likely to raise prices by the same factor as wages increase. There is no reason to think that prices will increase to such an extent that the benefit of the wage increase will be wiped out. Many things are factored into pricing decisions and a business’s bottom line. Does increasing the minimum wage result in layoffs and job loss? Most studies show and most economists agree that it does not. According to the US Department of Labor: a review of 64 studies on minimum wage increases found no discernable effect on employment. This is because the increases in overall business costs resulting from such a wage increase phased in over a period of years is, for the most part, modest. In some cases any job impact of a wage increase is offset by the economic stimulation and growth resulting from higher wages and higher spending. In Tompkins County, it is also important to remember that the vast majority of low-wage jobs are in retail, food service and hospitality industries that are tied to their locations and unlikely to be viable in other locations outside the County. So businesses are unlikely to leave. For example, can you imagine the Marriott moving to Seneca County because we have a Living Wage Law? Even if some employers do lay off workers, does that mean that a minimum wage increase is unacceptable? The standard we need to apply is how many workers would benefit from this policy, who are they, and how badly do they need the money? What about automation eliminating jobs if you raise wages? Automation is a fact of life – a tool that employers are using to increase profits wherever they can. Do we really want to push wages into the basement so that employers won’t have incentives to automate? Would that even stop them? The real problem is not automation in the low-wage sector; it is the very real negative impact that low wages have on working families. An imagined “robot apocalypse,” which has not been borne out in recent years as automation has already accelerated (unemployment has gone down, not up) is no reason not to focus on creating good living wage jobs. I am a middle income person. This doesn’t really affect me, does it? About one-quarter of American workers depend on public support/social services of some type; among the families of frontline fast food service workers this grows to about half (52%) dependent on public support. In addition 48% of home health care workers, 46% of child care workers, and 25% of the families of part-time college faculty members are on public assistance. These poverty-level wages cost US taxpayers over $150 billion each year in public support (Medicaid, EITC, TANF, food stamps) for working families. Our taxes pay for this. In effect taxpayers transfer over $150 billion/year to mostly multinational companies to subsidize their low wages and subsequent profits. How do employers get away with paying such low wages? They can pay such low wages because state and federal government have failed over the last 40 years to maintain a minimum wage that is a living wage, prevent wage theft, update rules related to overtime exemptions and strengthen the rights of workers to organize. “Depressed wages are the result of outdated policies,” states the NY Times (5/1/15). As labor standards have eroded, allowing profitable corporations to pay chronically low ages, taxpayers are footing the bill for the social services that workers paid less than a living wage need to live. Won’t small businesses be hurt by a living wage? Above all else small businesses need customers. Since virtually all of any increased wages paid to those at the bottom will be spent locally, the increase in consumer spending will benefit local business overall. A higher wage floor also benefits businesses because workers will stay on the job longer and be more productive. Small businesses (along with everyone else) will also benefit from a reduction in the taxes they will have to pay because of the $13 billion annually in NY public assistance costs that goes to working families. The fact that any living wage increase would be phased in over a long period gives all employers ample time to adapt to the increase, just as they have adapted to recent increases in the NYS minimum wage. Between 2013-17 the wage went up over one-third and businesses adapted. Why eliminate the sub-minimum wage for tipped workers? Employers in NYS are currently allowed to pay tipped workers including servers in restaurants, food delivery workers and nail salon workers as little as $7.50/hour as long as their tips during their shift bring them up to the general minimum wage of $10.40/hour. This creates an unfair two-tiered minimum wage system, one that 7 states have already outlawed and which would also be eliminated in proposed federal minimum wage legislation. The problem is that in many cases employers do not make up the difference when tips are low and this underpayment is difficult to enforce. As a result the poverty rate for tipped employees in states that allow the tip credit is significantly higher than the same workers in states that have outlawed it. The elimination of the sub-minimum wage provision does not eliminate tipping. It just makes the minimum wage independent of the tips, and thereby ensures all workers actually receive the real minimum wage. It also reduces workers’ vulnerability to sexual harassment (when their minimum wage is based in part on tipping these workers – most of whom are women – are forced to tolerate inappropriate behavior from customers, moreso than if their livelihood was less based on tips alone). Would a person receiving a Living Wage be disqualified from receiving public assistance? Since there are many different programs for public assistance, and since the qualifying conditions for these programs, including family size, can all be different and sometimes complicated, it is impossible to really answer this question in a general way. Everyone’s situation will be different. That said, the Living Wage is meant to provide an income sufficient for an individual to afford costs of living without public assistance. For families and for other qualifying conditions eligibility can change significantly. Please consider becoming a Member of the Tompkins County Workers’ Center as we ramp up on our campaign to ensure that every single worker in Tompkins County is paid a Living Wage! We welcome Membership Dues and gifts of all amounts and only ask that you give as generously as you can.